Electronics manufacturing in Mexico is a specialty within the manufacturing industry that holds different areas of expertise. 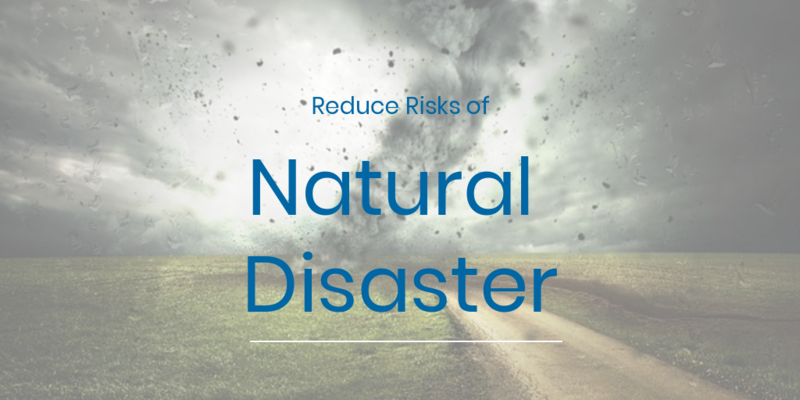 These parts are used in virtually every type of machinery or high end home appliance, affecting our everyday lives. The are a few top products that take over the electronic goods exports and a multitude of others that support a large part of the output, but the range of products being produced shows the ability of the electronics manufacturing industry in Mexico. According to the Observatory of Economic Complexity, Mexico’s top exports in 2016 were machines, specifically machines that use electronic parts. Computers, phones, video displays, appliances and other electrical components contribute to the $162 Billion USD in Mexico’s electronics exports to the world. Mexico has become a leading manufacturing center for electronics because of its proximity to large markets and its global access through free trade agreements. 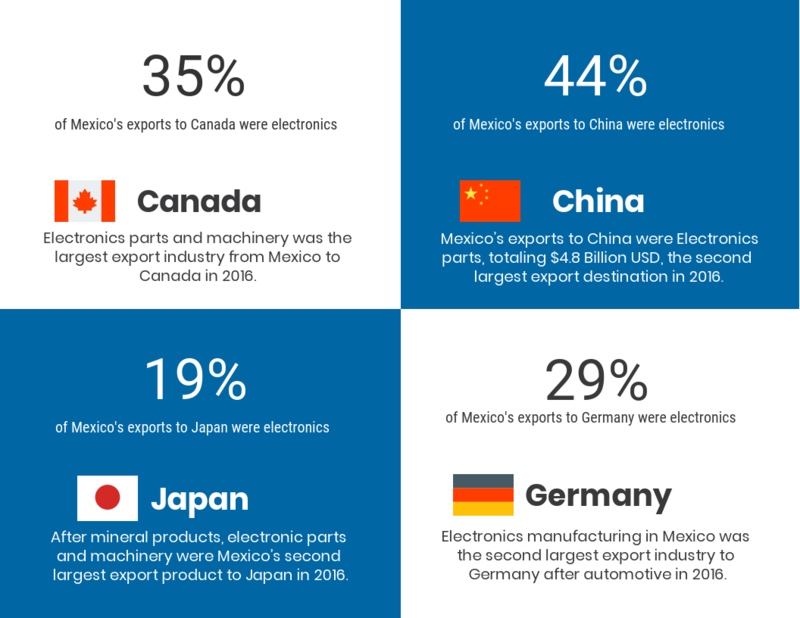 After the U.S., Mexico’s top export destinations for electronics are Canada ($8.78 Billion USD), China ($4.84 Billion USD), Germany ($2.51 Billion USD), and Japan ($1.15 Billion USD). 44% of the industry's total exports to China are Electronics parts, totaling $4.8 Billion USD, making the country Mexico's second largest export destination in 2016. In that same year, Mexico’s top exported products to China were integrated circuits valued at $2.2 Billion USD, telephones at $575 Million USD, and Low voltage protection equipment at $282 Million USD. Electronics parts and machinery was the largest industry exporting products from Mexico to Canada in 2016. That same year, 35% of the goods exported to Canada were built with, or had some form of, electronic device. The top exported electronic products were computers at a $23.4 Billion USD value, telephones at a $19.3 Billion USD value, and video displays at a $13.6 Billion USD value. Electronics manufacturing in Mexico was the second largest export industry to Germany after automotive in 2016. It was 29% of Mexico’s exports to Germany and produced many of the electrical components for automotive parts manufacturing. Overall, the top products exported from Mexico to Germany in 2016 were, computers totaling $376 Million USD, telephones totaling $245 Million USD, and electrical control boards totaling $178 Million USD. After mineral products, electronic parts and machinery were Mexico’s second export product to Japan in 2016. As 19% of the total exports to Japan, Mexico’s electronics manufacturing industry is positioned to rise in conjunction with mineral products. The top electronic goods exported from Mexico to Japan are telephones at $324 Million USD, microphones and headphones for $111 Million USD, computers at $102 Million USD, and gas turbines at $81.6 Million USD. The inherent diversity of the electronics manufacturing industry enables specialized supplier and assembly clusters to thrive throughout Mexico. 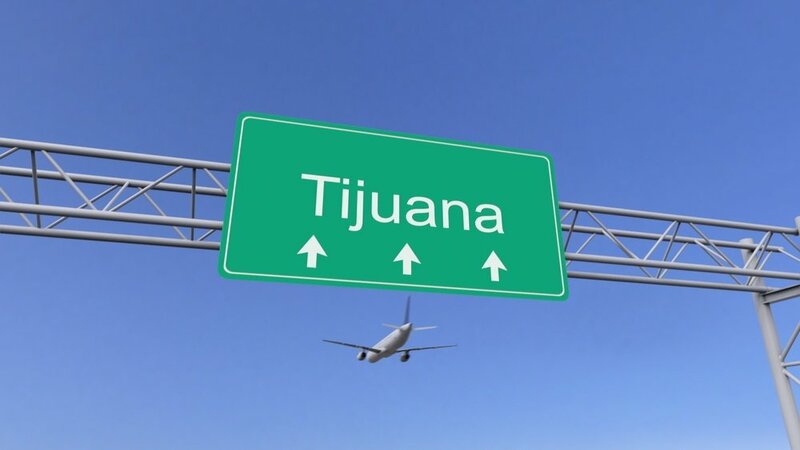 Specifically, Tijuana is home to one of the largest electronics manufacturing cluster, specializing in TVs, Radios, and other appliances. The success of Tijuana’s electronics cluster comes from the semiconductor supply chain that is comprised of 71 companies for a $419 Million USD production value in 2016. 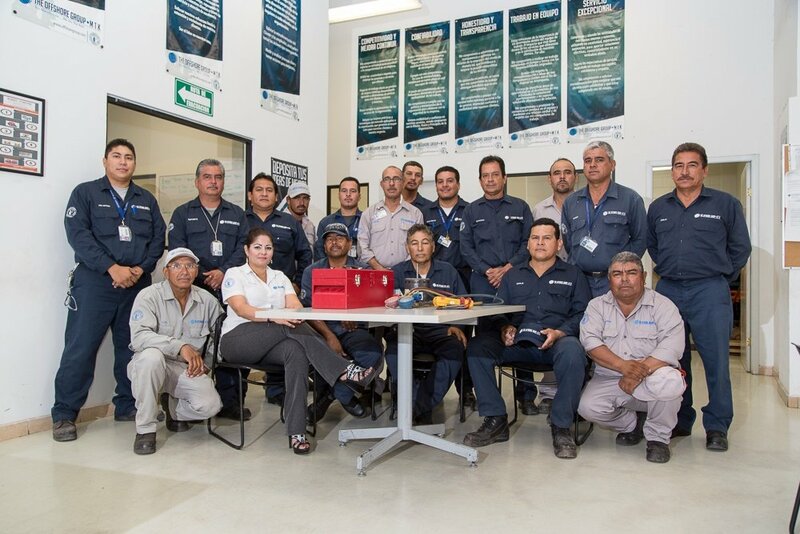 Guadalajara, Jalisco is another location flourishing in electronics manufacturing. 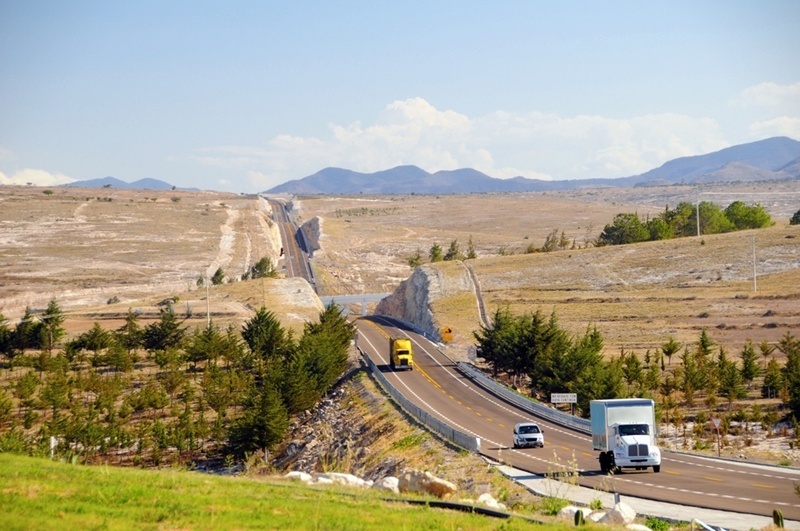 Also known as the Silicon Valley of Mexico, Guadalajara has established itself as a site for electronics investment. The city had $1,812 Million USD in foreign investments in 2016, and 83% of those investments went to the manufacturing industry. The city partners with these companies to improve local education programs and fosters skilled employees who thrive in high-tech manufacturing environments. 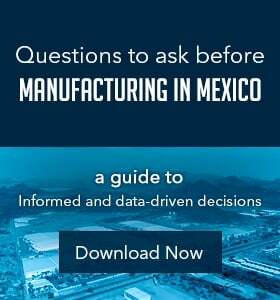 Overall, smartphones and computers are Mexico’s most frequently exported product to the world, representing the country’s history and experience in high tech manufacturing, and the skilled labor market that comes with it. As a top producer of electronics, Mexico maintains a competitive advantage for investment in the manufacturing industry.